Think about your goals. Are there any new budget items that need to be included? Are there any new mandates required by law? Can some budget items be eliminated? Determine how your income may change. Will your tax rate change? Has your population changed? Are there any new taxes? Will any tax expire? Decide between needs and wants. Do you need to purchase new equipment because the old is outdated or ineffective? Will a new purchase ease or alleviate a cost or burden? Be detailed with your biggest expenses. If salary is your largest expense, show the salary/ employer paid taxes and deductions increase per person, not as a lump percentage increase. The amounts budgeted with a percent increase could be off by thousands. Be realistic with your estimates. If you really don’t expect revenue to increase, don’t put an increase in your budget. If you are unable to pay for the expenses in your budget, cut some items, no matter how painful. Utilize the best tools available. Learn to use any budgeting tools provided in your financial and accounting software. Budget Preparation programs are a huge time saver. Rely on people in your organization with previous budgeting experience. 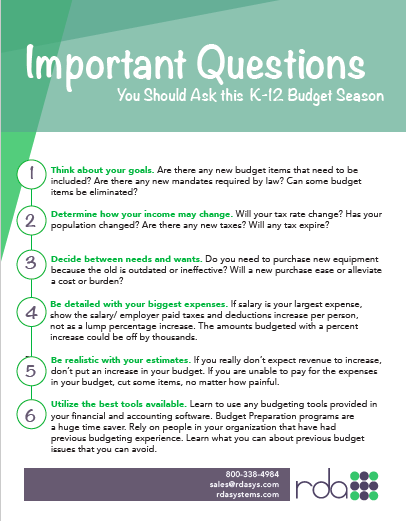 Learn what you can about previous budget issues that you can avoid.